Yesterday I took a break from "The Lake" to create a gift for a friend. 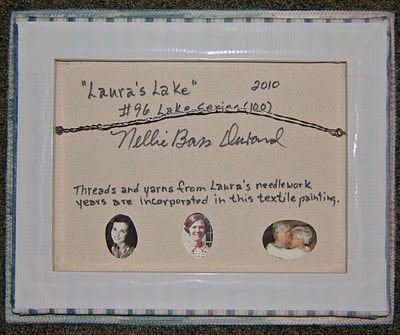 "Laura's Lake" - 14" x 11"
This piece honors my friend Laura who died in February of this year. Laura's 88 summers were spent on the beach of Lake Michigan here in Macatawa. The colors and light reflected on this lake and beach is symbolic of her full and gracious life. 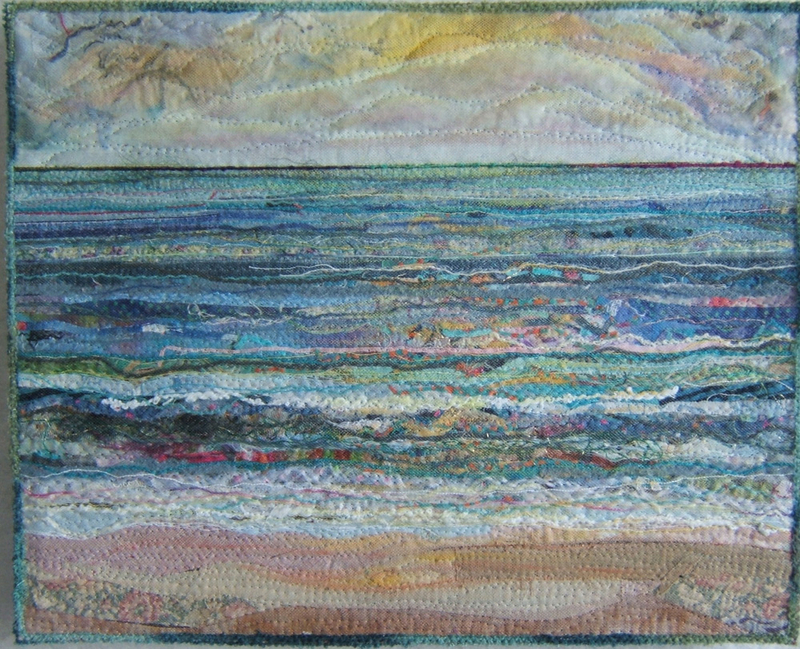 Laura was an accomplished needlework woman. 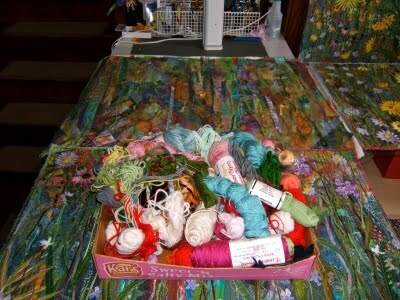 Near the end of last summer I was gifted a box of her threads and yarns. It pleased both of them to know that bits and pieces were incorporated into "Prairie Performance". I wrote about that here. 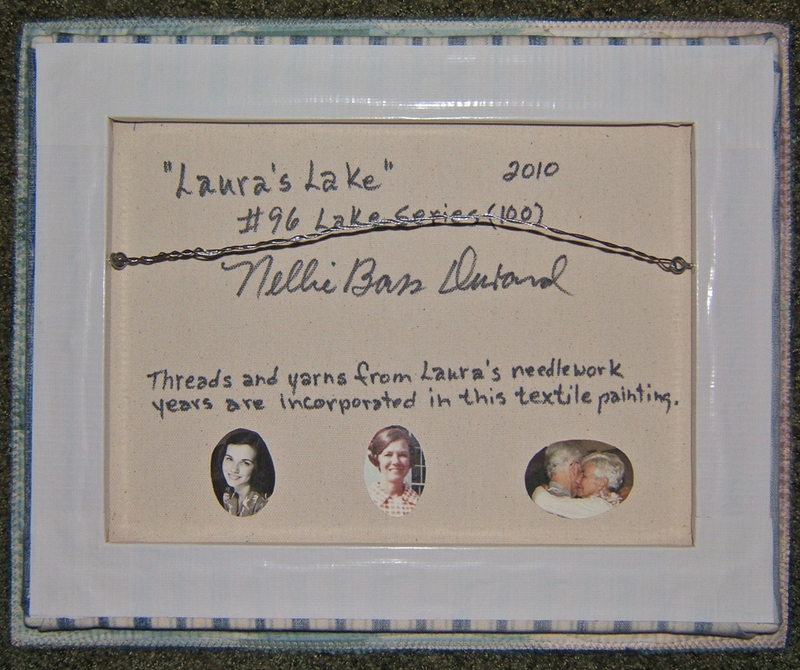 Her husband was touched to get back some of those yarns and threads in "Laura's Lake". What a bittersweet project for you Nellie and how beautiful it is. I'm sure Laura's husband and family will cherish this lovely piece of work. What a nice idea and a beautiful piece of art. I'm sure her family will cherish it for many years. It's lovely and what a wonderful tribute! Outstanding tribute and of course another lovely lake piece. I especially loved what you put on the back of the piece, I never think about how important the back of a piece can be. What a tribute. I am sorry for your loss of a friend. Her husband must love looking at this piece, feeling her presence as he does so. Lovely. That's lovely, both the piece and the sentiment. The back is wonderful for the personal information, and the way it adds a very personal touch with your handwriting. A beautiful tribute to your friend and I'm sure it will be a comfort to her husband too. A beautiful work (as always) and a beautiful tribute to your friend. Your heart and soul is in everything you do. I came here again after a time away because of your profile on Art Propelled. I went to see the Lake Series and am so impressed. Wow. Congratulations on the upcoming show. 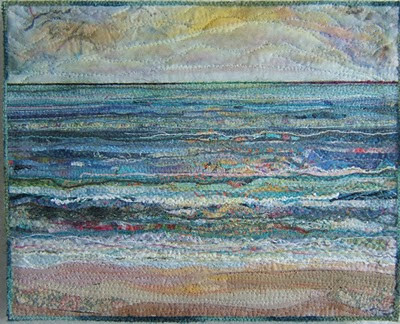 My condolences for your loss of your friend, and I think that making a Lake piece for her husband is a very beautiful and caring idea. June Challenge for "Interpret This"